Today is the 1st day of the 1st Crochet Mitten Drive! I am so excited to about this event! I was on my way home one day and I was lost in thought about how much my life has changed in just the last 5 years, let alone from my young adult life. I was thinking about all of the stumbling I've done and how many times I have had to ask for help. Asking for help isn't always easy...actually, it can be embarrassing! My grandmother is someone who has always been there for me and one thing she always says is "If you have it to give, you should!" She believes that if you have extra, then you should give to someone that has none. Her kind heart and generosity has inspired me to start this mitten drive. I'm not rich, but I am blessed with a wonderful family and lots of love. I have a roof over my head and food on my table. This is much much more than some. And I want to do something for those less fortunate then us. Last winter I read an article in my local paper about a group of homeless people living down by the river, some in tents, some not. I live in Maine....we have below zero temps for a lot of the winter. That article broke my heart! Last year I also overheard a couple of teachers at my child's school talking about how a few kids didn't even have winter coats, let alone gloves. That also broke my heart! These two stories ran together and I thought "Wow, we can all do so much with just one small gesture. We could change lives with just one pair of mittens!" Turns out, a lot of other designers feel the same way I do! So let's do it folks! Let's make those mittens and give them to someone in need! 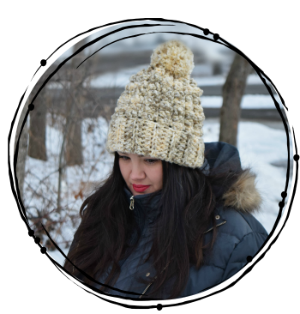 I am thrilled to present to you the first mitten design in this Mitten Drive blog hop. 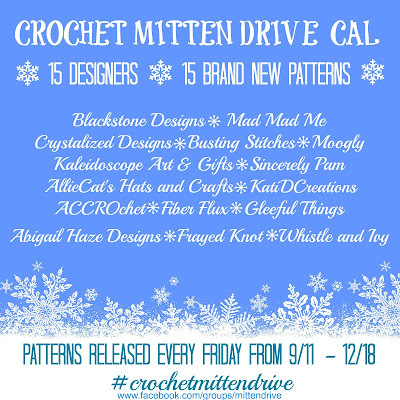 After the pattern will be a list of all the other bloggers and when you can get their pattern! If you're finding this pattern outside of the event, but want to join in on the fun click HERE! **Thank you for your interest in this pattern. This event has ended and this pattern is no longer free. You can still find it on Ravelry. 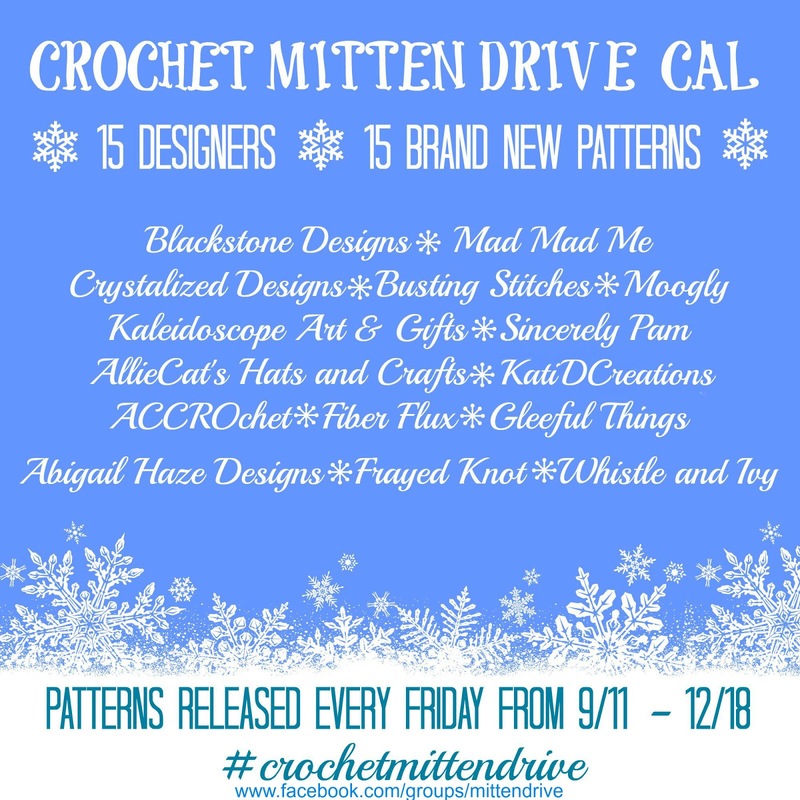 I really hope you enjoy this pattern and this mitten drive! 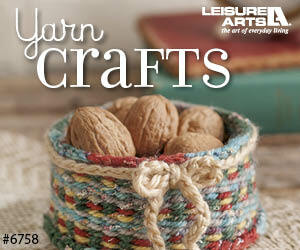 Don't forget to add it to you favorites on Ravelry so you can always find it! And one last thing! You can save 60% on the Chilly Cables Coatigans (Baby, Child, & Adult sizes) and the Chilly Cables Headwrap, Today 9/11 through Thursday 9/17 using code: MITTENDRIVE on Ravelry. Thank you all so much for stopping by and joining in on this wonderful event for a great cause! 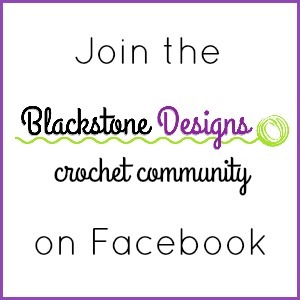 Keep up to date with my designs by joining the Blackstone Designs Crochet Community! Hope to see you there!! Written Pattern © 2015 Sonya Blackstone of Blackstone Designs. 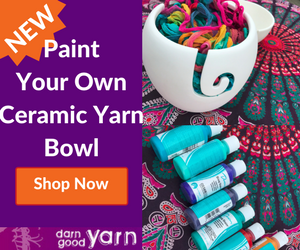 Please do not sell, share, or modify this pattern, but instead share the link to where the pattern can be found. You may sell items you make with this pattern. This pattern, as with all Blackstone Designs/Sonya Blackstone patterns, are not for educational use without written permission from the designer. It gets very cold around here (way too far upstate NY) all public school kids in my city have to walk. I am very excited to participate in this and donate to my local schools. 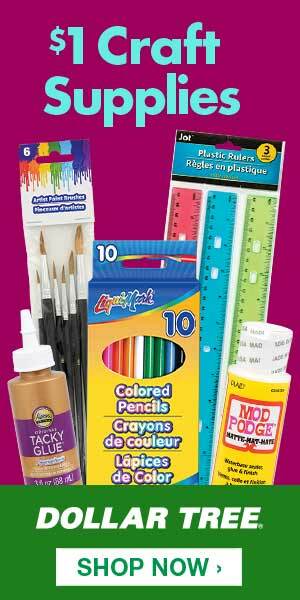 It's wonderful to donate to schools! You rock!! Thanks for sharing this beautiful pattern. Each year my granddaughter brings mittens I've made to the "Caring Tree" at her elementary school. 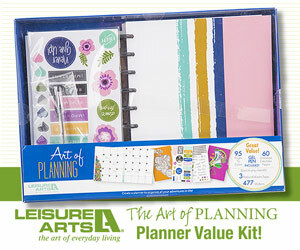 I'm always looking for something different and nice looking. Thanks again. I love the idea of a caring tree! 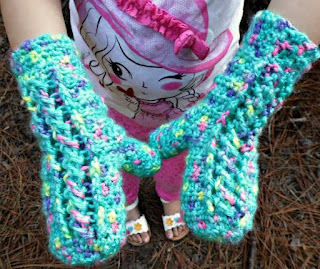 And how great that your granddaughter takes in your handmade mittens! These are wicked easy! Loved making them! Fantastic! I'm so glad that you're having fun with them!! Thank you for the beautiful pattern. 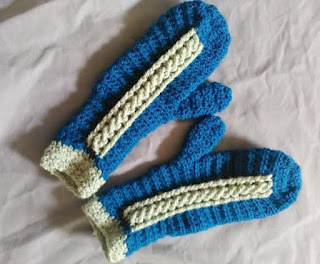 I wonder if you could help concerning a problem I encountered when I completed these mittens? The back of the mitten was a little longer than the front. It seems like the cable pulls the front down lower. 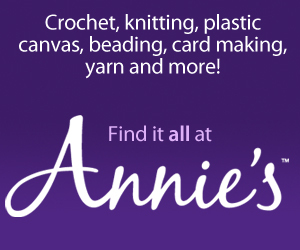 Am I crocheting too tightly on the cable? You're not crocheting too tightly, the cables do tug. If you pull on the cables to stretch them out, you should feel the FPDCs slide into place. This will help keep them from shortening the front. 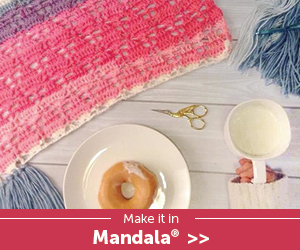 Thank you for sharing this beautiful pattern! 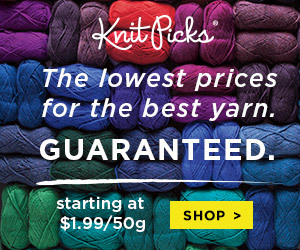 What color and brand is the rainbow yarn? I love it! I third this question! I love that yarn. I'm having some trouble with row 8...I don't understand how to double crochet behind the cables. 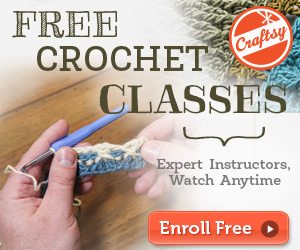 Do you mean like a back post double crochet? Where is the pattern for these mittens? They're not on this page and the link on ravely brings me here, where the pattern is not.